International Journal of Research in Health Sciences ,2014,2,2,711-713. 1Professor, 2,3 Resident, Department of Surgery, SBKS medical institute and research centre, Pipariya, Vadodara, Gujarat, INDIA. Neurofibromas (NF) are benign tumors of neural origin, of which roughly 90% appear as solitary lesions. They are classified into cutaneous, subcutaneous, and plexiform subtypes. Plexiform neurofibromas are the least common variant and usually are pathognomonic for NF I. Here, we present a case of isolated plexiform neurofibroma with a painless enlarging mass of the skull involving temporal, parital and occipital region in a 16 year old boy. 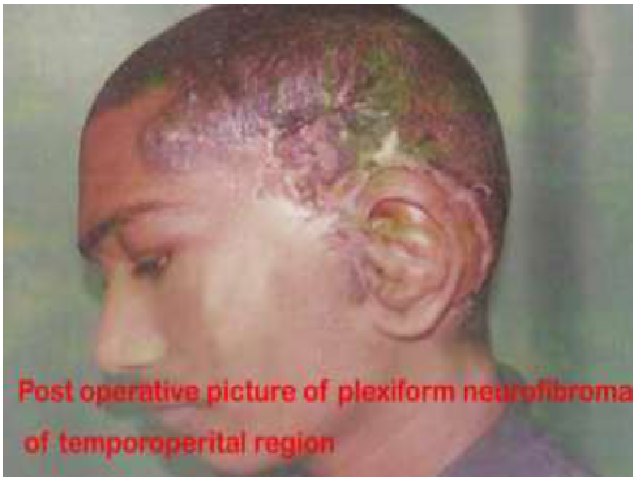 The present case is a diffuse isolated plexiform neurofibroma of the skull. Neurofibromatosis (NF) is a genetically inherited, autosomal dominant disease, characterized by multiple cafe au lait spots, cutaneous neurofibromas and "Lisch nodules." Neurofibromatosis can develop from a neural source at any age. These entities consist of multiple, twisted masses that grow along the axis of a large nerve, infiltrating and separating normal nerve fascicles. Malignant transformation is the main associated complication. Organisation (WHO) has subdivided neurofibromas into two categories, dermal and plexiform. Dermal neurofibroma arises from single peripheral nerve while plexiform neurofibroma is associated with a multiple nerve bundle.